My altitude app reads “6,000” feet. There’s no snow in sight. “7,200” feet. Bupkis. As we wind our way up Route 50—a two-lane highway traversing the majestic mountains from Sacramento to Kirkwood Ski Resort—I eagerly watch the scenery outside. I open the window. Still no powder. Last year was a stellar year for California skiers. La Niña was in full effect and the snow was piled as high as some roofs. All the ski resorts were packed. It seemed like everyone I knew was weekly having a blast riding that famous, pillowy-soft Western powder. This year I decided it was finally time to learn to ski. When some friends and I arrive at Kirkwood Ski Resort, a 35-minute drive from South Lake Tahoe, we are immediately impressed by how much snow has blanketed the trails. Despite the warm temperatures and lack of real snow pack, everyone is genuinely happy to be here. A cheery Santa narrowly misses me; a group of guys in t-shirts casually float by; and a girl whizzes past in little more than a sports bra. Seasonal or unseasonal weather, these guests are clearly game for anything. I take a group lesson ($59 for the lesson, all-day lift ticket, rentals) with a very patient, attentive instructor who does an amazing job turning a beginner skier into, well…an advanced beginner who can at least safely make it down the mountain. The other students in the group are friendly and jovial—perhaps just for the commiseration borne of our shared amateur status. By the end of the day, however, we are all pleading with the instructor for just one more run. And there is plenty to do aside from downhill skiing. 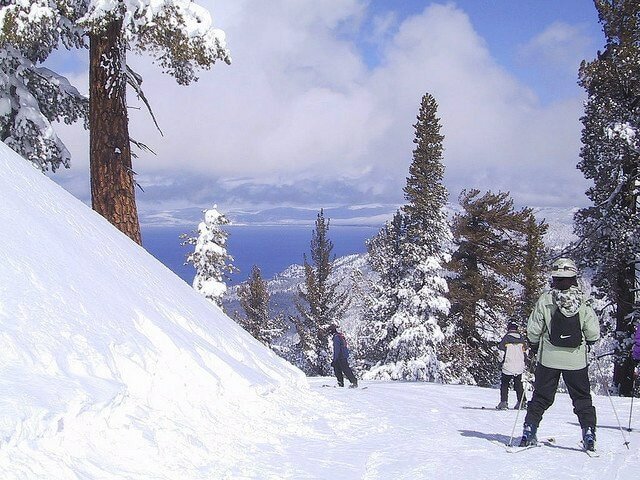 If you’re not a skier, you can try out their zip-line course (the first of its kind in Lake Tahoe, ($125 for a three-hour tour), or walk one of the many scenic hiking trails, or even dare to attempt the awfully fun “U.S. Airbag,” an over-sized air mattress that skiers (including the one in the above photo) fall onto after accelerating down a hill and ski jump. As we make our way back down Route 50, I find myself mesmerized by the immaculately carved out cliffs, the intimidating yet gentle wildlife, the endless evergreen forest. My altitude app begins its inevitable count back down and I am suddenly less fixated on the absent snow, and more enamored with the brilliant landscapes of the High Sierras. Kirkwood is a great spot for beginner skiers, who might consider booking the Stay & Learn to Ski or Ride package for $99/pp, which includes two nights in a studio condo, lessons, full day rentals, and lift tickets for two days (Sunday-Thursday). Visit the site for more stellar deals. Mark your calendars for the Girl Powder Mountain Festival on March 2-4, celebrating women and mountain culture with female-focused clinics, DJ’s, parties and more. The Freeride Flow Festival on March 23-25 will showcase the world’s top action sports athletes, musical talents and artists. Directions Bay Area Ski Bus provides bus transportation starting at $109 for a day trip.